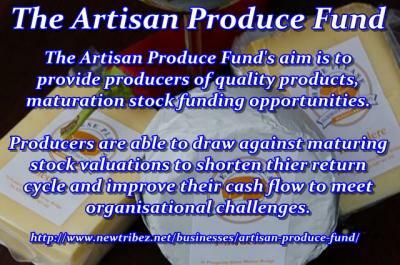 Artisan Produce Fund » NewTribeZ.net - Empowering you! thier return cycle and improve their cash flow to meet organisational challenges. The first round of Investment and funding opportunities OPENING soon! One of the greatest challenges facing Artisan Producers is the investment drain necessary to fund the production and maturation of stock before a return can be gained. It is a financial cost that impacts on the quantity, quality, consistency and price of produce and one that frequently leads to small producers being able to attain sufficient scale to warrant the venture continuation. 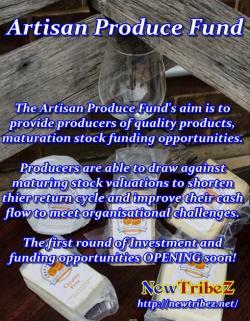 The Artisan Produce Fund provides investors and producers the opportunity to benefit from a mutually beneficial fund which provides scaleable funding and investment solutions for small to mid-sized Australian Operators.